More than 19 matches take place over some 17 courts in the first few adrenaline-fueled, high-energy days of the U.S. Open, the tournament that draws thousands upon thousands of tennis fans from across the country and the world to Flushing, Queens. And while everyone would love to be in 20 places at once, even with the significant technological advances of the 21st century, that seems nearly impossible. Or is it? While IBM can’t exactly help you teleport, it can do the next best thing. In partnership with the U.S. Tennis Association, IBM is catapulting sports into the digital age, leveraging its incredible data capabilities with its analytics to create a truly state-of-the-art experience for fans, coaches, and players alike. For over two decades, IBM has stood in partnership with the USTA with one goal in mind. As Noah Syken, vice president of global sponsorships at IBM, said Tuesday, that goal is simply making “the fan experience as amazing as possible.” As a company that has been in existence for over a century, IBM has consistently asked two major questions when it comes to its collaborations, Syken noted: “How do we help our partners come into the digital age?” and “What does the digital platform look like today?” When it comes to tennis, that answer is pretty exciting. Behind the scenes of the fast-moving game are equally fast-moving computer and analytic systems, largely dependent on IBM’s resident genius — Watson. From real-time data streams to SlamTracker’s Ball and Player Movement analytics, IBM is extending the fan experience to beyond simply watching a match. Operating under the belief that a more informed fan is a more engaged and ultimately happier fan, IBM has used its technologies to run analytics that bring new color to the game. 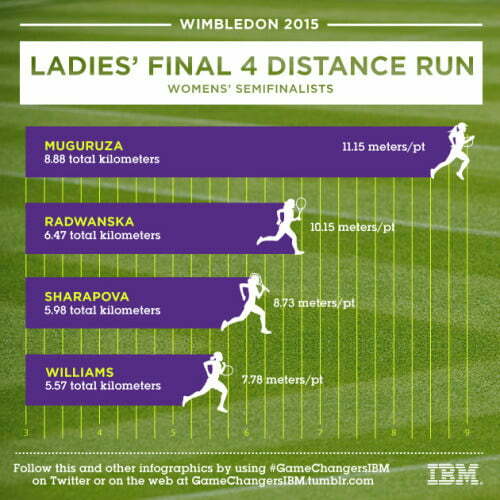 For example, an analysis of Wimbledon 2015 compares the distances run by the four female semi-finalists — unsurprisingly, Serena Williams, the ultimate champion, ran the least, clocking just 5.57 kilometers and averaging less than 8 meters per point. Garbine Muguruza, who came in second, ran significantly more at 8.88 total kilometers, and averaged over 11 meters per point. And these insights are not only of interest to tennis enthusiasts. They are also given to coaches and players within 30 minutes of the conclusion of a match, ensuring that the level of the sport continues to improve. And when it comes to IBM’s presence at the U.S. Open, the data is good indeed. Said Syken, “Data is the new natural resource, and what you do with it is really important.” While tennis may not seem like the most earth-shattering pursuit upon which to be using such resources, the IBM team was quick to point out that these same technologies are applied across myriad fields and industries. So today, it’s tennis. But as for tomorrow, the possibilities are endless. And with more than a century of experience, it seems that IBM is well-placed to contribute further.